"With the modern tools inherent in ArcGIS, we have everything we need to create mobile applications, capture critical data and forward the results to the right people in near real-time." Earthquakes are a fact of life in New Zealand and the experiences in Christchurch and Seddon (the July 2013 quake in Marlborough) highlight the fact that Councils have to be prepared to react immediately to ensure the safety and well-being of citizens. One of the key functions in the immediate aftermath of a seismic event is for emergency services to provide medical care to the injured and then inspect buildings for damage. This information has to be disseminated as fast as possible from the field crews to the command centre, decision-makers, the public and remediation teams. The GIS Department at MDC has developed a mobile application, ERBA (Emergency Response Building Application) that runs on Council i-devices and taps into ArcGIS Online and the IBM Smart Cloud environment, that does exactly that. 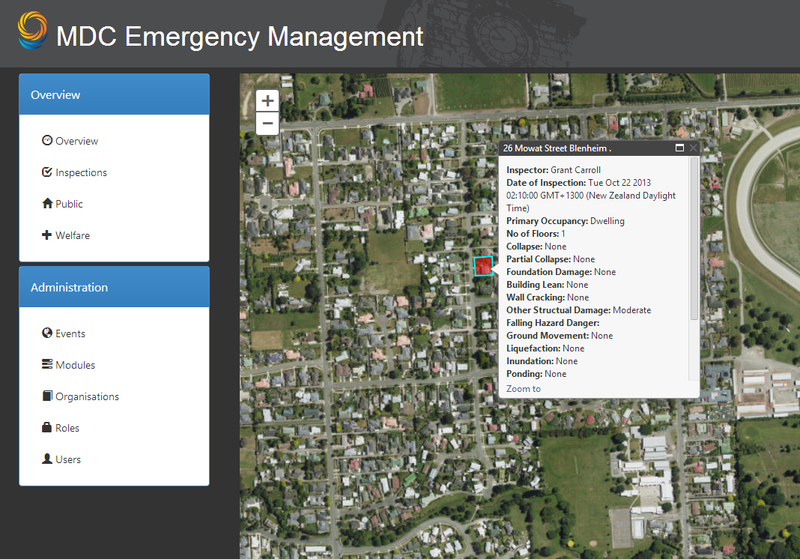 MDC’s ERBA (Emergency Response Building Application) empowers field crews and command centres to pinpoint areas of injury / damage and assign resources accordingly. Field crews at Marlborough District Council (MDC) can react promptly to seismic events, carry out emergency health and safety inspections and upload the information directly to Council decision-makers thanks to a mobile GIS (geographic information system) application developed by Grant Carroll and the GIS team at MDC. "In the immediate aftermath of a seismic event - or any other disasters such as floods or fires - field crews can capture and relay information on where people need medical attention to the command centre who can then allocate resources to those who need it most," says Carroll , Solutions Architect at MDC. "Once the physical well-being of residents has been addressed," continues Carroll, "inspection crews can use the same application and tools to record which buildings have been damaged, which are safe and which need further inspections. And the results can be sent in real time to the command centre so that they have access to the very latest information." "We started development on the application after the Christchurch earthquakes," explains Carroll, "but it wasn’t a huge priority. Our first version had a few drawbacks…for instance crews had to manually enter in address and occupancy information and it was on-line only meaning that field crews needed cell phone coverage for it to work. Plus the reporting capabilities were quite basic. But after the July 2013 Seddon quake…which hit the MDC quite hard… we made a major effort to improve the application which we named Emergency Response Building Application (ERBA)." The technology itself is fairly standard in New Zealand. ERBA is a mobile application based on Esri’s ArcGIS Online platform and the ArcGIS Runtime SDK for iOS . ERBA takes advantage of hybrid web services that are hosted on a MDC’s cloud server within IBM’s Highbrook Park (Auckland) data centre. The data is stored first locally and then in the cloud. Similarly, the app is resident on the mobile device (MDC is an i-device shop but, in theory, ERBA could run under Android as well) and the data, again, goes into the cloud. The command centre then accesses the data from the hosted site, on their desktop, tablet or phone. "One of the bottlenecks we identified on the first version was that crews had to type in too much information…address, owner, any important characteristics, etc…all information that we already had in the database," notes Carroll. "So we developed a routine using the GPS capabilities of the i-device. Crews simply hit the GPS button, their location is fixed and then the system automatically returns the property information of their location. And if a property is, say, across a river or similarly inaccessible, there is a manual over-ride. This speeds up the process immensely, increases accuracy and leverages all of the council data already held." MDC was also able to address the online issue. "Esri is constantly improving the ArcGIS Online tools," continues Carroll. "They just improved the ‘disconnected editor’ function so we can capture data even if the crews are out of service range. In an area with spotty rural coverage like MDC, this has been a huge improvement. We are also working hard to improve the reporting and display capabilities to web-based interfaces. Now that we have ERBA up and running we can continue to improve it as we gain more experience. Hopefully we’ll not have to test it under emergency conditions, but we’ll be ready if we have to." "The beauty of ERBA, MDC’s mobile application," says Kenna Kelly, Account Manager at Eagle Technology, the exclusive distributor of Esri’s ArcGIS technology in New Zealand and the IBM Cloud Business Partner of the Year (2012), "is that every Council in the country covered by Esri/Eagle’s Small Local Government Enterprise License Agreement (ELA) has access to these tools at no additional charge what-so-ever. Indeed, the ArcGIS ‘Collector’ app and the ArcGIS Online Mobile templates are free to download. All it takes to create similar applications is a good idea, some basic GIS programming skills and the vision and commitment to roll out mobile applications to Council staff. The benefits to ratepayers, the return on investment and the ability to react immediately to facts on the ground all combine to deliver on the promise of GIS." "With the modern tools inherent in ArcGIS," concludes Carroll, "we have everything we need to create mobile applications, capture critical data and forward the results to the right people in near real-time. We have been using GIS for a number of years at MDC and now we are really hitting our stride in extending the utility of the technology. And transferring the technology to other Councils could be effected quite easily because the data is more or less standard and we’ve already developed the application. Already we are talking with other Councils and anticipate sharing ERBA. So our initial investment could have a huge positive impact across the country." MDC has been a long time user of GIS technology and has an impressive array on online ‘Smart Maps.’ You can access these maps at http://maps.marlborough.govt.nz/portal/.